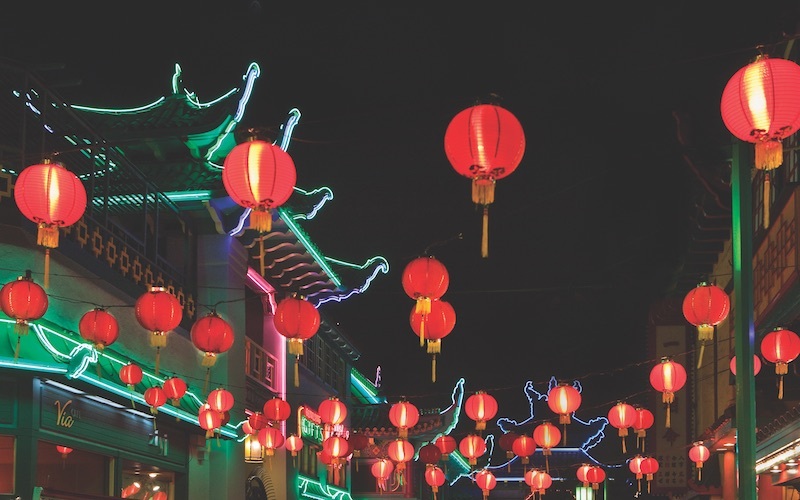 Home Nightlife 5 Ways to Ring in the Year of the Dog in L.A.
You may have said good riddance to 2017 back in December, but that doesn’t mean you have to stop celebrating. Those who mark their years by the lunar calendar are gearing up for days-long—sometimes weeks-long, if you’re extra like Disneyland—events that put our one-night soirees to shame. If you’re looking to commemorate Chinese New Year (February 16), there’s no shortage of fetes going on all over L.A. No matter which one you pick, luck and good fortune are sure to be yours. Mickey, Minnie, and all the other denizens of the Magic Kingdom get decked out in their finest qipao and changshan for this three-week extravaganza. Mulan and Mushu lead the Lunar New Year Procession, a parade featuring music and performances from the Acrobats of China, while the water-and-light show World of Color transforms into a tale about a little Chinese lantern. A word of advice: Show up hungry. The highlight of this New Year celebration is its street food festival, where 60-some vendors hawk Korean dumplings and bulgogi rice bowls, egg-puff waffles, roasted chestnuts, and more (plus brews from Sapporo and Lagunitas). Peruse stalls selling face sheet masks and other Korean skin care as well as Chinese threads, and scope out mind-bending sidewalk creations by chalk artists. More than 100,000 people turn out for the Golden Dragon Parade, which has been weaving its way through Chinatown since roughly 1889 (that makes it one of the oldest Chinese New Year celebrations in America). Today it has more than a dozen floats, erhu performances (Chinese violins), marching bands, celebs, and so much confetti. The pièce de résistance? A dancing golden dragon manned by up to 100 people. Take the Gold Line there if you hope to maintain your transpo sanity. Elaborate pavilions, hand-carved bridges, and stands of Chinese bamboo in the Huntington Library’s Liu Fang Yuan, or Garden of Flowing Fragrance, set the scene for martial arts demos, tai chi, Chinese music, and lion dancers. Don’t miss bian lian, or face changing, a tradition with roots in Sichuan opera that requires a performer to seamlessly and surreptitiously change into multiple masks. Between events, grab a lychee lemonade and stroll among the garden’s peach and plum blossoms. Once the smoke clears from the traditional salvo of 100,000 firecrackers, ring in the Year of the Dog and stick to your resolution to stay fit. Cyclists hit the road on Saturday for 20- or 40-mile rides. On Sunday, hoof it on a 5k or 10k walk/run. Your registration fee covers a slew of goodies, including a themed tee, a beer (for the over-21 set) and access to the entertainment at the Firecracker Festival. All net proceeds go to local elementary schools and nonprofit organizations. RELATED: The 9 Best Chinese Restaurants in L.A. Previous articleFind Your Groove at These Themed Dance Nights Around L.A.